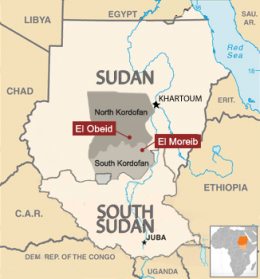 The Satellite Sentinel Project, or SSP, released a multimedia package today presenting evidence that Sudan’s notoriously brutal Central Reserve Police, also known as “Abu Tira,” participated in, and filmed, the systematic burning and looting of the Nuba Mountains village of Gardud al Badry in the war-torn region of South Kordofan, Sudan. ADDIS ABABA, Ethiopia – A summit between Sudanese President Omar al-Bashir and South Sudanese President Salva Kiir has yet to secure an agreement on a number of tinderbox issues between the two countries. The top-level meeting, which officially began today in the Ethiopian capital , is taking place two days after the September 22 deadline that the African Union established for the conclusion of negotiations between Sudan and South Sudan. On September 5, Sudanese President Omar al-Bashir called on the African Union to legislate protection of African space against “spy satellites.” Bashir, who has been indicted by the International Criminal Court, spoke at a telecommunications conference in Khartoum, pushing for a unified continent-wide space agency.